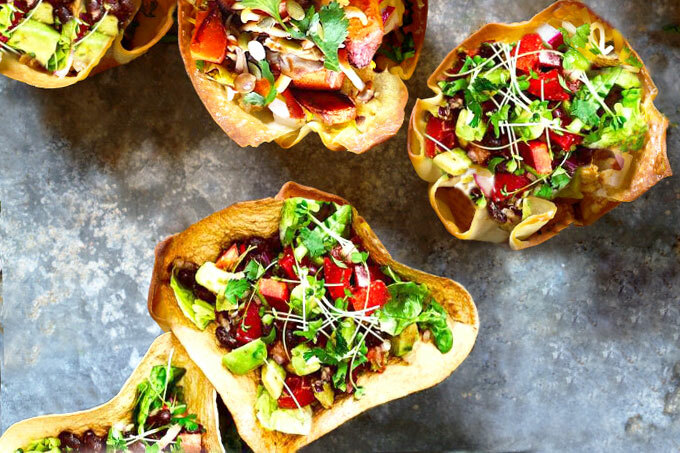 Who doesn’t like homemade corn tortillas baked into crunchy taco bowls filled with all kinds of goodness? While I appreciate classic tacos, my all-time favorite fillings include cauli-walnut crumble, salsa, lettuce, and avocado. You can serve them with a side of vegan sour cream or guacamole. 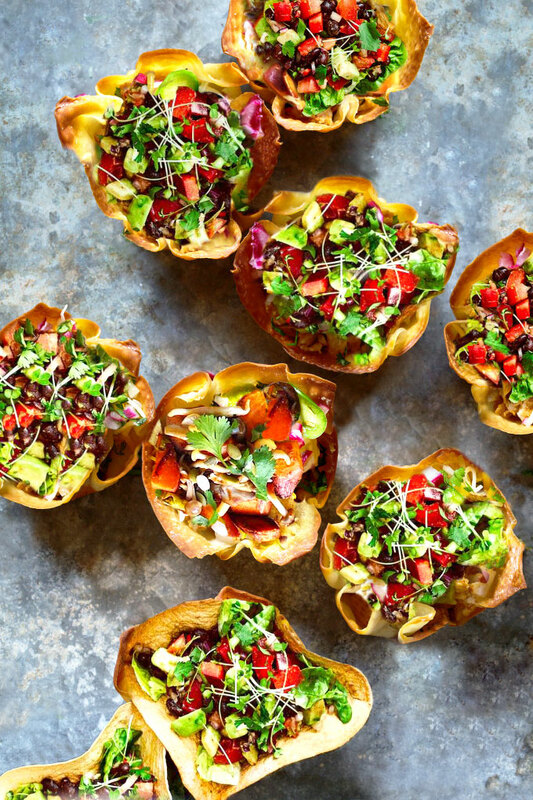 These vegan cauliflower walnut taco bowls will blow your mind they’re so good! My husband (Tanner) hates cauliflower. He always has. It’s just one of those foods he can’t get himself to eat. He hates the taste, the smell, and the texture. He can detect it in mashed potatoes, isn’t a fan of cauliflower rice, and definitely doesn’t want it front and center on his plate as if it was a steak or a roast. I can’t blame him though because he grew up in a household where cauliflower was only served one way – boiled. There’s nothing special about steamed cauliflower. In fact, as the cauliflower cells break down during the long, slow boil, they unlock the smelly sulfurous compounds within. Fortunately, there’s a better way to prepare cauliflower – caramelize (roast) it in the oven just like meat. Rather than go limp and rubbery as it does with steaming, the inside of the cauliflower beneath the sear turns velvety and meaty. The cauliflower soaks up the toasty flavors of any seasonings you use and presents itself as a thoroughly appealing option in shades of ivory, golden-brown and deep brown. I have written about corn tortilla ingredients in a separate post, so here I’ll focus on the faux “ground meat” (aka vegan ground beef) only. One of the two main ingredients in these cauliflower walnut tacos is the aforementioned cauliflower. Cauliflower behaves similar to mushrooms in that it absorbs flavors and provides chewy texture when roasted. I was actually considering adding mushrooms into the “vegan ground beef” mix, but then decided to keep the recipe simple. However, if you like mushrooms, you might want to add them in. Their flavor is rich, earthy, and meaty so you can’t go wrong here. To balance the little-too-soft, juicy texture of cauliflower, I used walnuts. Walnuts provide the needed fat content and perfect crumbly texture of ground meat. They are hearty and a little crunchy, but their texture changes into more elastic as you roast them in the oven. To flavor the cauli-walnut crumble, you can use any seasonings you like. Since we’re using this mixture for cauliflower walnut tacos, I used typical taco seasonings: sea salt (or Tamari), onion powder, garlic powder, smoked paprika, ground cumin, and chili powder. If you like some heat in your tacos, add some cayenne pepper as well. Finally, you might be wondering about the tomato paste. It’s totally optional, but I find that it brings out the seasonings, gives the “vegan ground beef” the right consistency, and helps with browning so the cauliflower-walnut mixture looks and tastes just like cooked ground meat. To make the cauli-walnut mince, place all the ingredients in a food processor and pulse a few times until the walnuts and cauliflower become crumbly. Be extra careful that you don’t over-process the mixture or else it will lose its crumbly texture and be too smooth. The texture should reassemble that of crumbly cooked mince. Spread the mixture onto a baking sheet into a single layer (use two baking sheets if needed). Don’t overcrowd the pan otherwise the cauli-walnut mince won’t dry out and brown evenly. You want as much of the mince to be exposed to direct heat of the oven and the baking sheet as possible. Roasting the faux “meat” serves several purposes. Since roasting is a quick cooking method, the cauliflower cells don’t break down enough to release that off-putting odor. Instead, roasting brings out the cauliflower natural sugars while creating a chewy texture. The walnuts turn a deep shade of brown and release their natural oils. The cauli-walnut crumble is done when it’s dry, crumbly, and brown. Serve it hot with the hard taco shells, salsa, shredded lettuce, guacamole, and anything else you like, and you’ve got delicious cauliflower walnut tacos. Who doesn't like homemade corn tortillas baked into crunchy taco bowls (or shells) filled with all kinds of goodness? While I appreciate classic tacos, my all-time favorite fillings include cauli-walnut crumble, salsa, lettuce, and avocado. These vegan tacos will blow your mind they're so good! Lay the tortillas out and brush both sides of each corn tortillas with a little bit of olive oil. 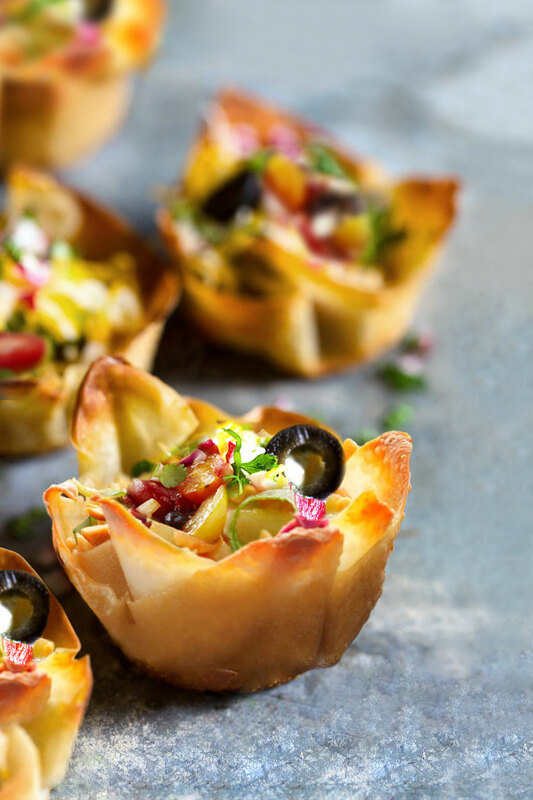 Taco cups (pictured): cut each tortilla into quarters, and press each piece into a regular size muffin tin. There's no need to oil or spray the muffin tins. The tortilla cups lift right out. Taco bowls: Turn a 12-cup muffin tin upside down. Nestle a tortilla in the space between 4 cups to form a "bowl." Repeat with 3 more tortillas, making 4 bowls total. Taco shells: carefully drape each tortilla over two bars of your cooling rack. Put the cooling rack on the oven rack (the tortilla ends should be in between two bars of the oven rack, creating a U-shape). Bake the tortillas for about 7-10 minutes, or until crispy and golden brown. Place all the ingredients in a food processor and pulse a few times until the walnuts and cauliflower become crumbly. Be extra careful that you don’t over-process the mixture or else it will lose its crumbly texture and be too smooth. The texture should reassemble that of crumbly cooked mince. Spread the mixture onto a lightly greased baking sheet into a single layer (use two baking sheets if needed). Bake for 30 minutes, stirring halfway through to prevent over-browning. The cauli-walnut crumble is done when it's dry, crumbly, and brown. Store leftover cauli-walnut "meat" in an airtight container in the refrigerator for up to 1 week. *You can find the recipe for homemade corn tortillas here. 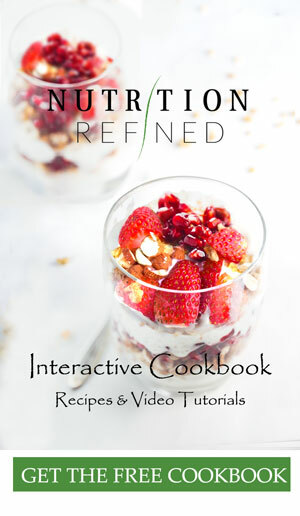 This recipe has been adapted from Cooking with Plants. I was trying to incorporate more fruits and veggies in my diet and searches brought me to you-tube videos of people who are vegetarian. I just love your videos, I want to try everything. You have the perfect amount of explanation and video coverage, and I love when your husband critiques the food. He seems very honest, and being a meat-eater, I smile when he says something would taste better with chicken. I might even agree. I was going to ask if frozen/thawed cauliflower would work, because that’s all I have on hand. But, I realized I need to buy other ingredients, so I will buy fresh cauliflower. Thank you for sharing with this old grandma. I hope to fix and eat many of your recipes in the days to come. Aw, this is such a thoughtful comment. Thank you so much Carmel. I am so happy you’re enjoying the videos. That means a lot! Ahhh, Tanner … he is a funny guy. There are vegan dishes he prefers over the traditional version (he LOVES vegan mac and cheese, for instance). And then there are dishes he likes to keep “authentic” – like tacos – with meat and cheese, lol. The good thing is that he’s willing to try everything 🙂 Thank you once again for your comment, Carmel! Petra, I made this (and one other) of your recipes over the weekend. I LOVE this “meat” replacement. It was quick and easy and very tasty! I didn’t have time to make the tortilla shells, but I HAVE purchased the special cornmeal to try it soon. We used store-bought blue corn taco shells, BUT, once trying the cauli-walnut mixture, I enjoyed it more without the shell. I basically ate the taco filling and all the toppings (tomato, romaine, and some salsa and nutritional yeast) without the shell. DELICIOUS! My own taste-tester (my husband) also loved it. Thanks for continuing to come up with great recipes. Yay! Thank you so much for letting me know, Kristi! 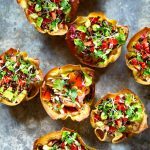 It always makes my day when people enjoy the recipes 🙂 I have never had blue corn taco shells – do they taste just like regular yellow corn taco shells? So interesting! I have never even seen them in the store. Anyway, I am really happy you and your husband liked the taco filling. Thank you once again for your feedback! This recipe looks great . I would love to try it but I don’t do well with corn. Is there another substitute for it. Can it be made with quinoa flour. I try to stay away from white flour an gluten. I cannot believe how good the seasoned roasted walnut/cauli combo tastes. My husband and I just loved these tacos. We used fresh tomato, rocket and a tahini dressing to finish – yum yum! We used some of the leftover taco ‘meat’ to garnish salad and as a baked potato topper….so many uses. Equally good straight from the fork! Will be making these again for sure and looking forward to trying your home made tortilla recipe too, looks so simple. Thank you! I have been meaning to make this for a while but I kept forgetting walnuts as they are not a staple in our house. I just made some and it is still in the oven, but i did get a taste of the raw mixture and I love it. It definitely has a mexican flavor, almost reminded me of Doritos as weird as that may sound. I am already planning to make this mixture again, but this time to put in the dehydrator to make crackers/chips. The raw mixture would be great a great topping for salads and potatoes I think. Can’t wait until it comes out of the oven so I can try it cooked.